One of Melbourne’s most distinctive office buildings – 1 Spring Street, also known as Shell House – has been included in the Victorian Heritage Register. 1 Spring Street is one of the few buildings constructed after 1980 to be included in the Victorian Heritage Register. 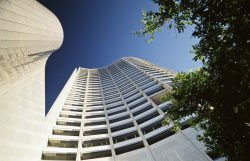 It was designed by renowned architect Harry Seidler and is noted for its aesthetic qualities and prominent position at the edge of the Hoddle Grid. “Shell House has been loved by architects, designers and the general public for a long time. It is the only high rise tower designed by Harry Seidler in Victoria. It is a fitting corner piece to the Hoddle Grid and a landmark CBD building,” Heritage Council Chair Stuart MacIntyre said. Completed in 1989, it won a number of architectural awards soon after its completion. Shell House is one of an important series of high rise tower projects designed by Harry Seidler both in Australia and overseas from the 1960s to the 1990s. The registration states it is an outstanding example of a late modernist office building in Victoria. The sculptural effect of the building – mainly its curved and interlocking shell like shape – are enhanced by large scale artworks on site such as the mural ‘Bathers and Pulpit Rock’ by Arthur Boyd and Charles Perry’s sculpture, ‘Shell Mace’ at the Spring Street entrance. These artworks are also included in the building’s registration. Once the headquarters for Shell, 1 Spring Street is now a mixture of government and commercial offices. Details and other recent registrations.